MILWAUKEE — Giannis Antetokounmpo and the Milwaukee Bucks won the game. Dwyane Wade countered with a classy move as the Miami Heat trudged off the court. "He is definitely a mentor, somebody I watch from afar," Middleton said. "(He's) one of my favourite players growing up. Still one of my favourite players to this day." Wade was honoured with a video tribute of his days starring at Marquette (2001-03) during a timeout in the first quarter. He tapped his heart and smiled when he was shown on the video display. He also got a standing ovation from the sellout crowd. 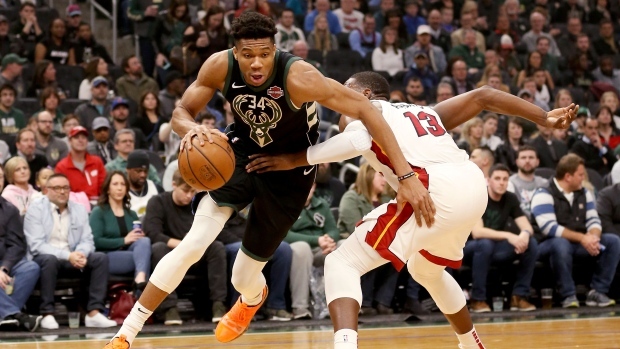 The win came with a brief scare for the Bucks: Antetokounmpo went down in a mix of players after stealing a pass from Goran Dragic early in the second quarter. Milwaukee immediately called a timeout and after a few moments, Antetokounmpo limped to the bench favouring his right leg. A short rest got him right back on the court. The Bucks improved to 22-1 when shooting 50 per cent or better. Milwaukee was 50.6 per cent (43 of 85) against the Heat, who shot 37.6 per cent (32 for 85). The Bucks have outshot their opponents in 54 games this season and are 52-2 in those games. Milwaukee is 7-0 this season when they shoot 50 per cent or better and hold the opponent under 40 per cent.